Thanks for visiting our website. We have been serving in the Czech Republic with the Open Door Libraries (formerly ICR) for the past 21 plus years. 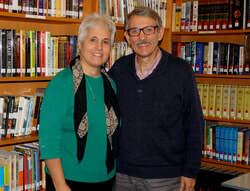 We hope that the information here will be helpful to share about the “ministry of books” that God has established through the Prague Christian Library. Thank you for your interest, partnership and prayers. We feel incredibly blessed in serving here as we daily experience God's provision, strength and encouragement and are so grateful to all who partner with us and invest in this ministry through prayer, sacrificial giving and service. If you would like to know more about how you might be involved, please contact us – we would love to hear from you!! For more specifics on needs click HERE for Special Projects.